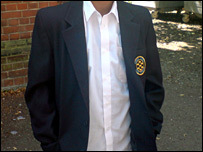 Parents concerned about knife crime are getting "slash-proof" school uniforms for their children. A company is offering to modify blazers and jumpers by lining them with knife-resistant Kevlar. Bladerunner in Romford, east London, said it has been contacted by the parents of five local pupils about the £130 adaptation. But the government said stabbings in schools were very rare and accused the firm of scaremongering for profits. Jim Knight, Department for Children, Schools and Families minister, said: "Stabbings in schools are exceptionally rare. This is a commercial organisation scaremongering to sell its products." Kevlar is a synthetic material that can be spun into a fabric which makes it light but also very strong. Seven teenagers have so far been stabbed to death in London this year. Adrian Davis, from Bladerunner, said: "We introduced Kevlar-lined hooded tops out earlier this year and off the back of that a few parents asked us if we could alter school uniforms to make them stab proof. "So we are offering the service on a private, individual basis." He added the pupils were not from any one school. Alf Hitchcock, from the Association of Chief Police Officers, said it was an "extraordinary step". "The reality of course is that crimes involving knives are proportionately very very low. "But we do recognise that some parents do have that fear (of crime) and some feel they need to go to these steps." One parent, Jo Coleman from Romford, said she was thinking of getting her son's jacket lined with Kevlar. She said: "I think paying £130 is worth it for peace of mind - kids spend more than that just on trainers. "I think it is a good idea. You are not so much worried now about adults snatching kids, but about the other children."